If you do not use Microsoft's protection program, but are considering using it, take a look at part 1, the Microsoft Free Anti Virus tutorial. If you already use MSE take a look at part 3, the Microsoft Virus Protection tutorial. Has Microsoft's Anti Virus program ever detected a virus on your computer? Which virus did it detect? What damage would it have caused had it not been detected? Develop your own personal web page by simply completing the Microsoft Anti Virus In Action Form at the bottom of this page. Read about Other Visitors Experiences at the bottom of this page. Microsoft Security Essentials is replaced by Windows Defender in Windows 8+. It is essentially the same as MSE only re-badged and re-worked for Windows 8+. Real-time protection should be switched ON at all times! If this isn't the case, turn it on, NOW!. Real-time protection monitors your computer all the time for potential threats. Quick Scan: Scans key operating system and application files for any suspected files or file changes. The areas scanned are the most common areas targeted by malware. When you first install MSE a quick scan is performed. 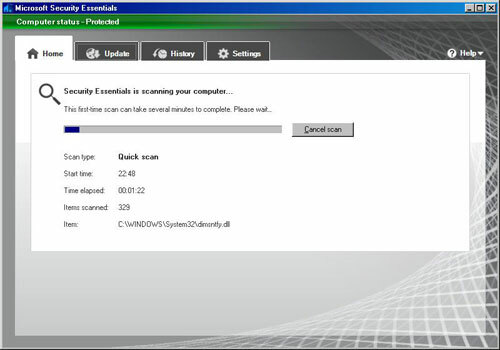 As with all Scan Options, an alert is given if suspicious software is detected on your computer. When any scan is in progress, the System tray icon depicts a CD spinning inside the blue castle. When the Scan is completed click the red Clean Computer Button to remove the threat. You can also click the Show Details link to find out more about the threat. 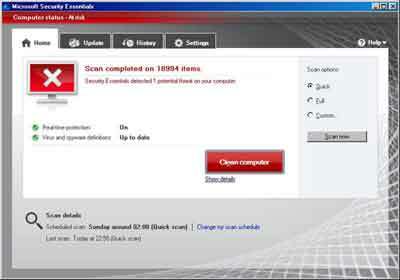 Details include the Virus Name, a Description of what the virus does and a Recommended Action to deal with the threat. Recommended actions include. Quarantine: Stops the suspect program from running until you decide whether to Allow or Remove. In Windows 7 the quarantined program file are located in. In the example below I choose Remove from the Recommended Action drop-down menu then click the Apply Actions Button. After you click the Apply Actions Button MSE begins the process of removing the infection. 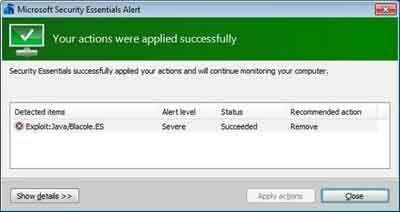 Once the threat is removed you see a green message saying Your Actions Were Applied Successfully. Click the Close button. To initiate another Quick Scan, click the Quick radio button then click the Scan Now button. If you computer is clear of any threats you will see the following screen. Full Scan: Scans every single file, folder and program you have running on your computer. This is a thorough scan that can take some time to complete. The time it takes depends on several factors including the capability of your computer hardware components and the number of hard drives, files and folders you have. A Full Scan is selected in the same way as a Quick Scan. Custom Scan: Enables you to select specific Drives or Folders to scan. A full scan is then performed on your choices. When your choice of scan is completed and real-time protection is On, and the virus definitions are up to date, the system tray icon is green with a white tick in it. This is a convenient way for you to know that everything is OK. A red icon with a white cross tells you there is a problem, e.g. definitions file is out of date, or you have an infection. It is also worth noting that you can scan individual files and folders by Right Clicking and selecting Scan With Microsoft Security Essentials... From the resulting menu. The Microsoft Virus Protection tutorial is the final part of the Microsoft Security Essentials series. Take a look and review your own setup! It is important you keep the virus protection program up to date with the latest virus definition files. If you prefer to update MSE manually rather than through Windows Updates take a look at this Lifehacker (Opens New Window) tutorial. 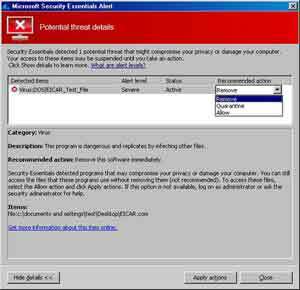 Has Microsoft Security Essentials detected a virus on your computer? Which virus did it detect? What damage would it have caused? Enter Your Title e.g. "Exploit:Java/Blacole.ES"